THE number of homes to be retrofitted, making them warmer and cheaper to heat, will increase by 5,000 to 30,000 next year. 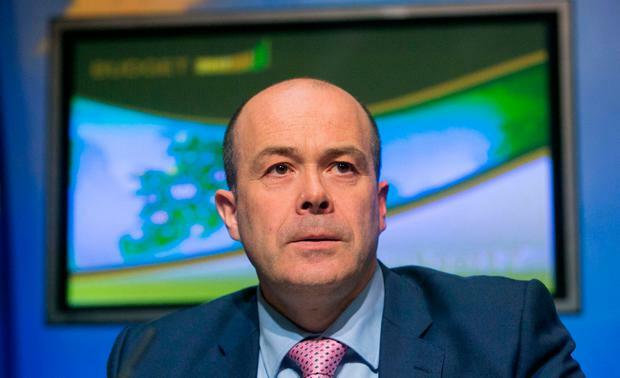 Communications, Climate Action and Environment Minister Denis Naughten said a commitment to retrofit one million homes by 2020 would not be met, but that State investment in energy efficiency and renewables would help achieve climate change targets. Climate change was referenced by both Public Expenditure Minister Paschal Donohoe and Finance Minister Michael Noonan in their speeches, with Mr Noonan describing it as the "global challenge of our generation". But there is concern about the lack of new incentives to drive change towards a low-carbon future, including encouraging motorists to switch to electric vehicles or move to public transport. The VRT exemption worth €5,000 for electric vehicles is extended for five years, and two years for hybrids, worth between €1,500 and €2,500. The Government expects just 1,000 electric vehicles to be sold in 2017, up from 500 this year. Additional funding of just €31m will be allocated to the CIÉ, limiting the group's ability to provide additional services and encourage a switch to bus and rail. Some €100m will be spent next year on energy projects designed to save 116,000 tonnes of carbon and help support 3,000 jobs. Mr Naughten also revealed that €500,000 would be spent on a national dialogue on climate change, with ratification of the Paris climate agreement due to take place in the coming weeks. He said the State was playing "catch-up" in relation to its obligations on global warming. "This is as much an opportunity as an obligation," he said. "In any event, it is our children's future and a vital national interest." Among the main measures aimed at reducing energy consumption and ramping up investment in renewables include €7m for a renewable heating incentive, €22m for communities keen to drive energy efficiency and €8m to upgrade homes for low-income households. Mr Naughten said the national dialogue on climate change would need to engage "with the usual suspects", but with young people also. "It's the young people who will need to make the changes required and deal with the consequences of this," he said. "We're talking about reaching our (climate change) targets for 2050. We have to engage with all of the sectors." There is also an extension of the scheme of accelerated capital allowances for investment in energy-efficient equipment to sole traders, including farmers. Larger vehicles using natural gas instead of diesel will enjoy a minimum rate of excise for eight years. Carbon tax will not be imposed on solid fuels that include an element of biomass, and there will be tax relief for combined heat and power plants which produce more efficient electricity. Some €211m has been set aside for the agriculture Glas scheme for farmers, with some 50,000 participants expected by 2017. The Sustainable Energy Authority of Ireland has been given funding to look at how to drive behaviour change, and the Government is also exploring how to ramp up production of bio-energy crops. Capital spending is largely focused on roads and not new public transport options. The Environmental Pillar, which represents the views of 29 NGOs to government, said the Budget was a "missed opportunity" as it failed to set out the "foundations" for a low-carbon economy, with no incentives to reduce consumption, waste or pollution.